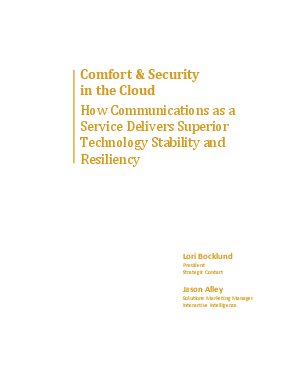 Comfort & Security in the Cloud - Read this white paper to learn how communications as a service delivers superior technology stability and resiliency. Learn about the world of the contact center and the technology today that offers richness and diversity, yet brings it a level of complexity that challenges many resource-constrained companies. Interactive Intelligence offers a communications as a service solution that is uniquely positioned through its architecture and the accompanying support services to deliver on the promise of "comfort and security" that contact centers seek.